Yes, it’s a kids’ craft, but so much more! This mini bookshelf fosters organization skills. 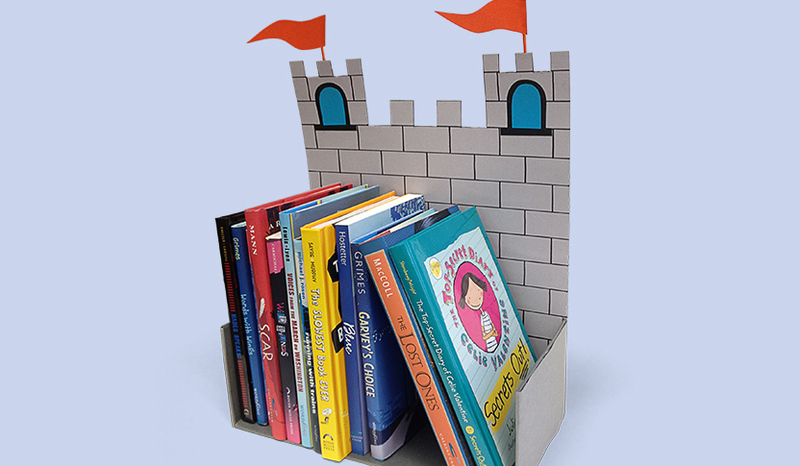 Encourage your prince and princess to read by keeping their favorite books at hand and in sight. Kids can corral their homework books or keep library books all in one place. It’s a royal reminder to read! Photo by Guy Cali Associates, Inc. Remove the lid and cut off one long side of a shoebox. Cover the box with cardstock. Cut a piece of poster board as wide as the shoebox and 13 inches tall. Cut the top to look like a castle. Draw stones with a marker. Add cardstock windows. Add flags made from toothpicks and cardstock. Glue the castle to the back wall of the shoebox. For younger kids: Use the castle as a play space or home for your small figurines. You can use dollhouse furniture to stage your action, or create some of your own scenery. Let your imagination go wild. For older kids: For a panoramic bookcase, make two or three book holders and set them side by side. Treat the poster board backdrops as one scene, depicting an incident from a favorite book, a view of your town, or Mount Rushmore (the faces could be you and your friends!). Craft by Wendy Bickel; text by Mary Sears.